Maddie Lipp prepares to serve. The Wildcats fell to Michigan in the Big Ten Tournament championship match. With a chance to add a tournament championship to its regular season title earned a week ago, Northwestern advanced all the way to the final match of the Big Ten Tournament. The No. 12 Wildcats (21-5, 11-0 Big Ten) had the top seed in the tournament and started the weekend by making quick work of ninth-seeded Maryland (11-13, 5-8) and fourth-seeded Ohio State (14-8, 7-4), ranked No. 28 in the country. However, NU’s 13-match Big Ten unbeaten streak came to an end when second-seeded Michigan (17-9, 10-1), ranked No. 23 in the country, outlasted them in the championship match. On Friday, the Cats beat the Terrapins 4-0, but were pushed to their limits. The day began with a loss from the No. 1 doubles team of seniors Erin Larner and Maddie Lipp. The other two doubles teams picked up the slack and secured the doubles point by taking both of their respective sets by a score of 6-4. But NU was not out of the woods yet. Junior Rheeya Doshi was the first player off the court in singles with a convincing win. Sophomore Julie Byrne followed suit shortly after with a straight set win of her own, but all of the remaining singles matches went three sets. Lipp quelled any uncertainty by trouncing her opponent 6-1 in the final set, leaving three matches unfinished and clinching the victory for the Cats. The next day, NU faced off with the Buckeyes and once again got off to a positive start by taking the doubles point. Byrne and Doshi put the Cats up 3-0 for the second consecutive match with two two-set wins. But junior Lee Orn lost her match 3-6, 6-2, 6-1 to give Ohio State a point. Still, senior Alex Chatt sealed the 4-1 victory in straight sets and sent NU to its first Big Ten Tournament title match since 2014. The win marked Chatt’s fourth consecutive singles triumph, but the senior said she doesn’t care about individual stats. On the final day of the tournament, the Cats matched up with the Wolverines. After racing out of the gates with the doubles point, NU lost at Nos. 3 and 4 singles and found itself in a 2-1 hole. Chatt and Doshi both won on their respective courts and turned the scoreline toward the Cats, 3-2. The only two matches remaining were Lipp’s and Larner’s, both of which went three sets. 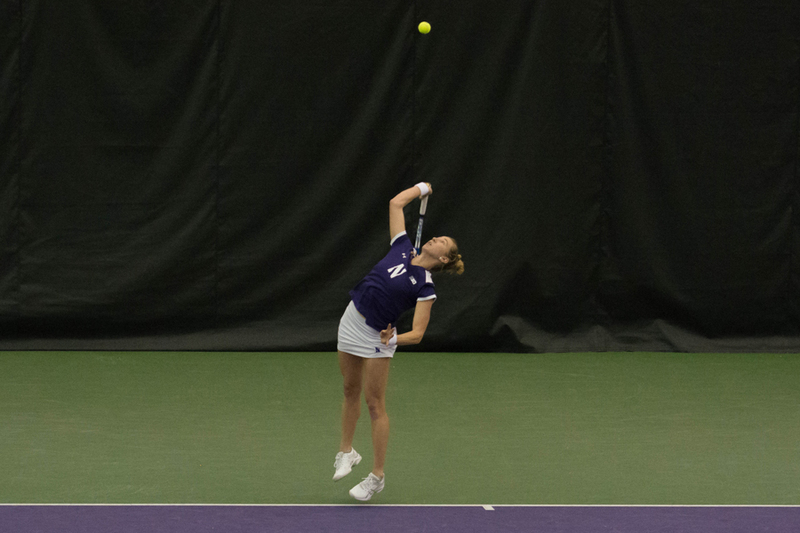 Larner won her first set but lost the next two, leaving NU’s hopes on Lipp’s shoulders. After splitting the first two sets, Lipp found herself up a break, 4-3, in the third set. However, she failed to close out the match, losing the last three games and, in the process, giving the Big Ten Tournament championship to Michigan in a 4-3 nail-biter.